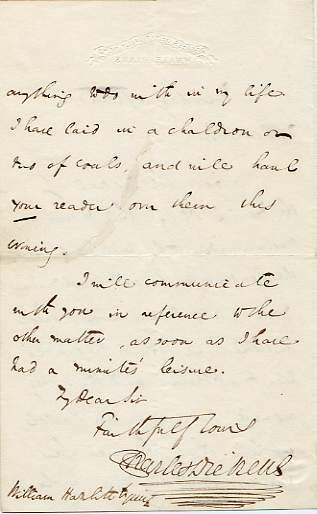 Autograph Letter Signed ('Charles Dickens') to William Hazlitt (1811-1893, editor and translator), 2 pages 8vo, Offices of the Daily News, 'Thursday afternoon', no date. The first page lightly and evenly browned; near-invisible repair to small tear; integral blank leaf. A relatively early letter in Dickens's elegant script, commiserating with Hazlitt on his treatment by the 'readers' or sub-editors, promising to haul them over the coals and to discuss another matter when he has the leisure. Only two letters from Dickens to Hazlitt are recorded in the Pilgrim Edition of The Letters of Charles Dickens and the present letter is thus apparently unpublished.